From “Teachings of Jesus,” Liahona and Ensign, Nov. 2011, 90–91, 93. He gave priesthood power to His Apostles and to others. His teachings light our path and show us the way back to Heavenly Father. 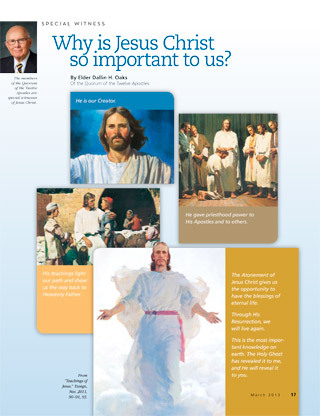 The Atonement of Jesus Christ gives us the opportunity to have the blessings of eternal life. Through His Resurrection, we will live again. This is the most important knowledge on earth. The Holy Ghost has revealed it to me, and He will reveal it to you.